When Jesus spoke He used simple language and also made use of images, which were examples drawn from daily life, to be able to be easily understood by all. Therefore, they listened to Him willingly and appreciated His message, which went straight to their heart: and it was not complicated language to understand, as that which Doctors of the Law used at that time, which was not well understood but was full of rigidity and distanced the people. And with this language Jesus made the mystery of the Kingdom of God understood, it was not a complicated theology. And an example is that which today’s Gospel brings: the parable of the sower. .Jesus is the sower. We note that, with this image, He presents Himself as one who does not impose Himself, but who proposes; He does not draw us by conquering us, but by giving Himself: He throws the seed. He strews His Word with patience and generosity, which is not a cage or a trap, but a seed that can bear fruit. And how can it bear fruit? If we receive it. Therefore, the parable concerns us especially: in fact it speaks more of the soil than of the sower. Jesus effects, so to speak, a “spiritual x-ray” of our heart, which is the soil on which the seed of His Word falls. Our heart, like the soil, can be good and then the Word bears fruit – and so much — but it can also be hard, impermeable. This happens when we hear the Word, but it bounces off, in fact as on a road: it does not enter us. Between the good soil and the road, asphalt – if we throw a seed on “cobblestones” nothing grows; however, there are two intermediate soils that, in different measure, we can have in ourselves. The first, says Jesus, is the rocky one. Let us try to imagine it: a rocky ground is ground “where there is not much soil” (Cf. v.5) so that the seed sprouts but is unable to put down deep roots. So is the superficial heart, which receives the Lord, wants to pray, love and witness, but does not persevere, gets tired and never “takes off.” It is a heart without thickness, where the stones of laziness prevail over the good earth, where love is inconstant and passing. But he who receives the Lord only when it suits him, does not bear fruit. There is, then, the last soil, the thorny one, full of brambles that choke the good plants. What do these brambles represent? “The cares of the world and the delight in riches” (v. 22), says Jesus explicitly. The brambles are the vices that are at odds with God, which choke His presence: first of all, the idols of worldly wealth, living avidly, for oneself, to have and for power. If we cultivate these brambles, we suffocate God’s growth in us. Each one can recognize his small and large brambles, the vices that dwell in his heart, those more or less rooted bushes that do not please God and impede having a clean heart. They must be torn out, otherwise the Word cannot bear fruit; the seed will not develop. Dear Brothers and Sisters, Jesus invites us today to look within ourselves: to be grateful for our good soil and to work on the soil that is not yet good. Let us ask ourselves if our heart is open to receive the seed of the Word of God with faith. Let us ask ourselves if the stones of laziness are still numerous and large in us; let us identify and call by name the brambles of vices. Let us find the courage to make a good soil remediation, a good remediation of our heart, bringing to the Lord in Confession and prayer our stones and our brambles. Thus Jesus, the good sower, will be happy to carry out an additional work: to purify our heart, removing the stones and thorns that choke the Word. May the Mother of God, who today we remember with the title Blessed Virgin of Mount Carmel, unsurpassable in receiving the Word of God and putting it into practice (Cf. Luke 8:21), help us to purify our heart and to keep the presence of the Lord. My heartfelt greeting to all, faithful of Rome and pilgrims from various parts of the world: the families, parish groups and Associations. In particular, I greet the Sisters Daughters of the Virgin of Sorrows, on the 50th anniversary of the pontifical approval of their Institute; the Franciscan Sisters of Saint Joseph, on the 150th anniversary of their foundation; the directors and guests of the “Domus Croata” of Rome, on the 30th anniversary of their institution. I would like to greet especially the Carmelite Sisters and Friars on their feast day. I hope that they can continue decidedly on the way of contemplation. A special greeting goes to the Venezuelan Catholic community in Italy, renewing my prayer for your beloved country. I wish you all a good Sunday. Please, do not forget to pray for me. Have a good lunch and goodbye! 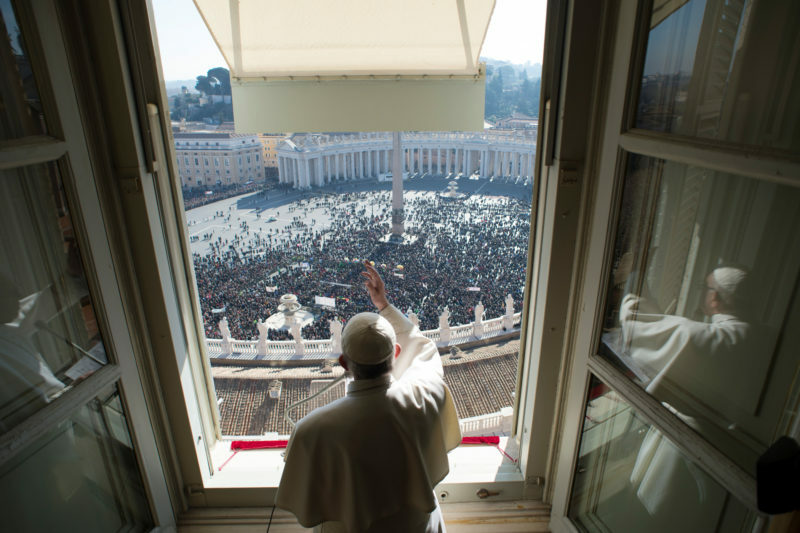 Pope at Angelus: Does Your 'Soil' Bear Fruit? "To Create in Society a Conscience of Respect for Our Surroundings"